Are you seeking for ways and intends to make your windows spotless yet again? Do you want to know how to skip chores like window washing without lifting a finger? You have chosen the right assistance – the experts of window cleaning in Canning Town will take care with this matter in no time. Your windows along with their frames and sills will look perfect, we guarantee that! You will no longer need to sacrifice your leisure time – the results of our work will fully delight you. Our services combine highest quality with affordable price rates, so don't hold up – request an estimate now to save time, energy and money! We also provide our professional services in nearby areas: Victoria Docks, Custom House, North Woolwich, Silvertown, Beckton. We use the most progressive procedures to be sure that you receive the best window cleaning. With our water-fed extension pole system and jet washing methods, you will enjoy perfectly clear look of your windows. We connect our poles to water supply in our vehicles to make sure that there is no danger for the exterior of your residence or business premise. For higher windows, we employ fully secured rope access method. You can benefit from these cleaning techniques now – just ring 020 3746 3113! You will have perfectly looking office with the help of the experts of commercial window cleaning. You can rely on our high end services for every kind of business premises. For example, if you own a small shop, we can completely polish its windows by using our water fed extension pole system – it gives us the chance to as high as the fourth floor. If you seek flawless look for the glass panes of a tall business property in London and the neighbouring areas, we will use our rope access tools. In any case, you will enjoy excellent results right away. 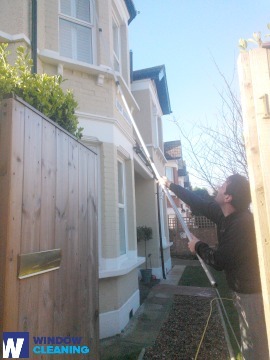 You can count on the skills and experience of the specialists for cleaning all types of windows. The glass surfaces in our competence are: single or double windows, sash ones and bay windows. Of course, if you have garden windows, French doors, conservatory or skylights, we will make them nicely-looking, too. With our progressive methods and latest machinery, we can cope with all kinds of window cleaning, even with hard-to-reach glass panes. Hire us for window cleaning in Canning Town for your residence. We will use previously mentioned techniques – water fed extension pole system for lower windows and rope access equipment for taller buildings. For the whole process we use purified water. Request a cleaner today – call 020 3746 3113 and speak with our call centre staff. You also have to option to fill in our online booking form or use our chat option. The nearest tube station serving E16 Canning Town is London City Airport.